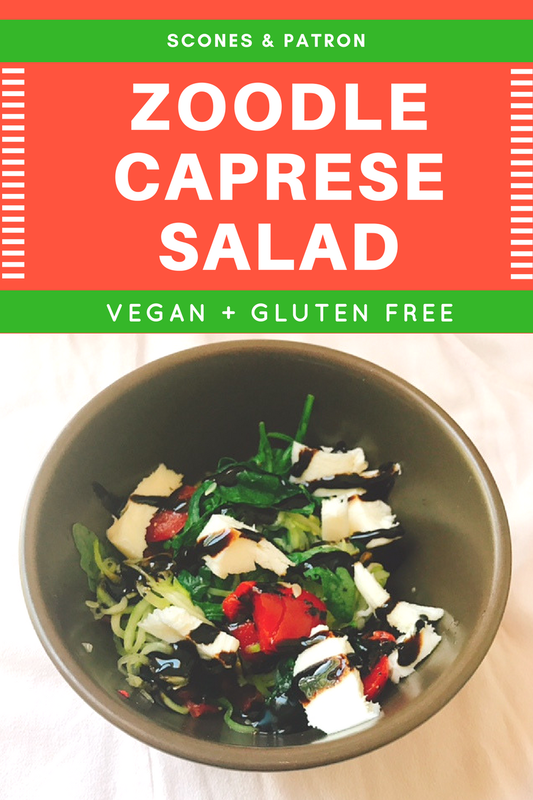 This spin on a traditional Caprese salad uses zucchini noodles as a base to make a delicious, healthy and gluten free meal that can do triple-duty as a lunch, dinner or side salad. Great news, friends! After a week away from me in her homeland (Iowa), my best friend Kelsey has returned to DC! My rough wake-up call on Wednesday before work necessitated a quick, healthy lunch that I could pack for the office. Luckily, I had the foresight to make this zoodle salad the weekend prior! Let me tell you, there is nothing like a healthy smoothie in the morning and a caprese salad in the afternoon to kick a nagging hangover - and this takes no time at all to throw together! Begin by spiralizing your zucchini into thin noodles. Dice your red peppers up into bite-sized pieces, and half your cherry tomatoes. Heat a large pan over medium-high heat and add 1/2 inch of water. Add your spinach and cook 2-3 minutes, until mostly wilted. Strain off the remaining water, then return the pan to the stove and add the zucchini noodles and roasted red peppers. Heat through. Transfer to serving dishes and rip your fresh mozzarella and basil into small pieces. Sprinkle onto each serving. Top each dish with spices and balsamic glaze, then serve! Easy as that, your lunch (or dinner) (or side dish) is on the table! Perfect for busy days, lazy days, or hungover days post-Irish Trashcan Tuesday. Is that just me?